Paul Craig Roberts is one of the most prolific economic writers in America today. As a former Wall Street Journal editor and former Assistant Secretary of the Treasury, Roberts is a walking encyclopedia on monetary policy, economic theory and Wall Street history. 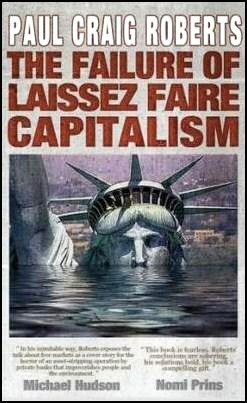 After publication in Germany in 2012, his latest book, The Failure Of Laissez Faire Capitalism And Economic Dissolution Of The West, is now available in the U.S. as an eBook. If you’ve read a Roberts’ column over the past few years, you know there’s nothing timid or constrained in his writing. The same can surely be said for this current work. Roberts expertly details how the one percenters have masterminded a political and economic takeover that just keeps on giving to the one percent as the economy wobbles, the U.S. debt explodes and the middle class is hollowed out. Roberts does not miss a key construct in how the game was able to continue for so long: “The absence of growth in real consumer incomes resulted in the Federal Reserve expanding credit in order to keep consumer demand growing. The growth of consumer debt was substituted for the missing growth in consumer income.” To make the mountains of debt magically disappear into thin air, it was “securitized, given fraudulent investment grade ratings, and sold to unsuspecting investors at home and abroad.” Now, explains Roberts, the debt has come home to roost: consumers are buried under credit card and mortgage debt and lack the wherewithal to spend. Roberts correctly believes that the seriousness of the financial crisis has focused too exclusively on Wall Street without proper focus on the attenuating factor – that the dramatic expansion in consumer debt was used as a substitute for the lack of growth in consumer incomes as jobs were offshored. To this critical piece of the puzzle, I would add that when a country concentrates the majority of its wealth and income within the hands of a tiny numerical percentage of its population, the rest of the population does not have the purchasing power to buy the goods and services produced by the corporations owned by the one-percent class. (According to the Economic Policy Institute, as of 2010, the top 5 percent of the wealthiest Americans own 67.1 percent of all publicly traded corporations while the bottom 80 percent own 8.3 percent.) Thus, we enter a perpetual cycle of mass layoffs and downsizings, producing ever less purchasing power for the masses. It should serve as a dire warning that Gross Domestic Product (GDP) limped in at a feeble one-tenth of one percent in the fourth quarter of 2012. Unlike Jack Lew, our newly installed Treasury Secretary, Roberts has no problem laying the blame for the Wall Street collapse in 2008 squarely at the feet of financial deregulation. Lew, a former executive of the mega bailoutee, Citigroup, testified before Congress that he didn’t feel deregulation was the cause. That might have something to do with the fact that with Lew’s blessing, his former boss, President Bill Clinton, is the man who deregulated Wall Street and put the gambling casino/investment banks inside the commercial banks holding insured deposits — an incendiary combination that blew up the marketplace just nine years after Clinton signed the legislation, the Gramm-Leach-Bliley Act of November 12, 1999, overturning the depression era investor protection legislation, the Glass-Steagall Act. After this epic failure of capital allocation, one might have expected Congress to set Wall Street back on the road to proper functioning. But instead of bringing new companies with new innovations to market to ensure good jobs in the future, Wall Street turned itself into a manufacturing and warehousing operation for subprime mortgages – debt on residential homes – having nothing to do with innovation or creating new industries for the future. Roberts offers some bold ideas for reform. One stand-out idea is to eliminate management performance pay for short-term profits. Currently, corporate executives of publicly traded companies are forced to focus on the next quarter’s earnings report at the sacrifice of longer term success of the business.